Unflinching focus on growth. Unrivaled prowess in healthcare. Optimize your efforts with Chardan—the only independent, global investment bank that’s as invested in your success as you are. We specialize in biotech and healthcare technologies—enabling companies that deliver radical breakthroughs to get the funding they need. We invest in the future—and it shows. We’re the leading bank that underwrites, advises, manages, and sponsors special purpose acquisition companies (SPACs). * Based on deal volume, for 2016, 2017, and 2018. We partner with innovators to help them successfully navigate the path from early-stage venture to larger public company. Chardan truly understands the ins and outs of our business, and they have been a great partner that has grown with Vuzix over the years. Take your investment or company to the next level. We'll help you with financings, mergers and acquisitions, and everything in between. Attain financing on your private or public company—from equity, debt, or convertible funding to IPO. 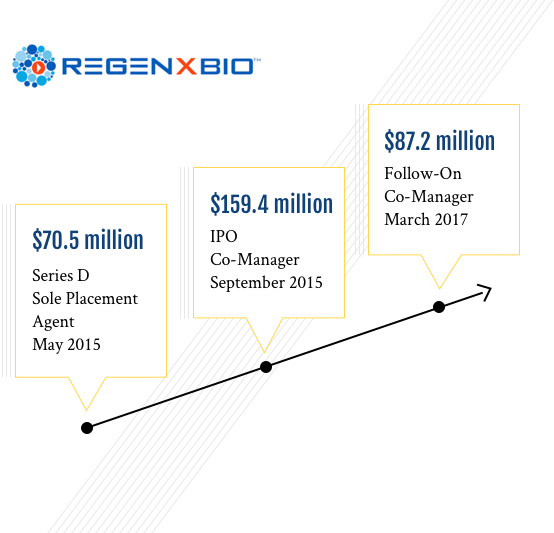 A leader in the biotech industry, REGENXBIO is developing technologies critical to the success of innovative gene therapy products with the potential to cure a range of devastating diseases. Find out how Chardan enabled the growth of this groundbreaking platform. Chardan is sponsoring the event and a cycling team for this great cause to raise money for rare disease research. 100% of the donations to this fundraiser will go DIRECTLY to cutting-edge research. Discover the latest research, news, and events at Chardan.